Heating, ventilating and air conditioning, known as HVAC, is a critical end-use in residential, commercial and most industrial buildings for providing human comfort. HVAC is also one of the biggest users of energy in buildings, accounting for nearly 44 percent of total energy used in commercial buildings across the United States. 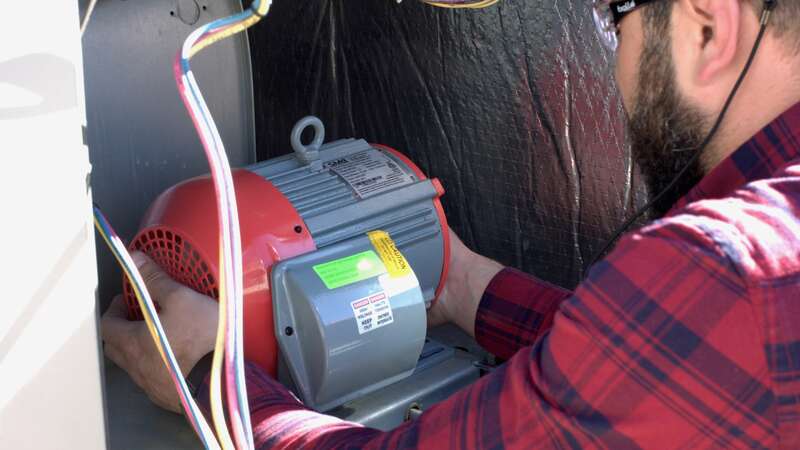 Most residential and smaller commercial HVAC Roof Top Units (RTU) in the U.S. are equipped with low-efficiency, fixed-speed induction fan motors. These motors turn by inducing an electric current in the rotor. The electric induction process is inherently associated with inevitable adverse side effects that hamper efficiency and operational cost. Additionally, the heat generated from inefficiency can reduce the motor life, resulting in unexpected downtime and repair costs. Worse yet, these motors cannot efficiently and cost-effectively vary their speed and when they do, they experience significant efficiency degradation. Software Motor Company (SMC) has developed a new software-controlled, high rotor pole switched reluctance motor that can dramatically improve the efficiency and controls. By taking the simplest and most reliable motor ever made — a switched-reluctance design used in nuclear reactors and mines for decades — and developing patented hardware improvements and leveraging computing technology in mobile phones and electric vehicles, SMC has developed a more reliable, efficient and intelligent motor driven by software. SMC is revolutionizing the motor industry by combining its low cost, high efficiency, built-in motor reliability, variable speed operation, and an IoT controller into a single system. These features enable building operators to cost-effectively enhance the operation and maintenance of their HVAC systems. It’s motor technology features a patented high-rotor pole “switched reluctance” design that demonstrates 30-90 percent potential energy savings in HVAC applications. While the SMC technology can be used in water pumping and potentially vapor compression, in this particular project the application mainly focused on the RTU’s supply fan. Through the Wells Fargo Innovation Incubator (IN²) program, National Renewable Energy Laboratory (NREL) researchers have been testing and validating the energy efficiency and performance of the SMC technology under various operational scenarios. NREL has leveraged available industry intelligence including information from the Department of Energy’s advanced RTU campaign to identify critical performance gaps that hamper the energy efficiency of these units. Preliminary tests performed at NREL resulted in actionable recommendations to improve SMC’s control algorithm and identify target performance improvement areas for their motors. The motor can be programmed based on data interaction with algorithms in a cloud-based setting, allowing controllers to potentially respond to building, utility and weather data in real time. For the next testing phase, Walmart generously provided a rooftop air conditioning unit that was installed in one of the thermal isolation chambers at NREL’s Thermal Test Facility. NREL recently replaced the existing fan motor in the RTU with an SMC motor and the system will be tested to quantify the power and energy use impacts of SMC’s technology under various control schemes. Once these impacts are quantified, the company will be able to communicate the value proposition of the technology in measurable terms based on independently verified data. The SMC motor is not only improving energy efficiency but introducing new intelligent and control capabilities that help with reliability, maintenance, and overall building automation.